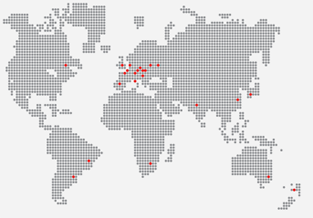 Thermit Welding (GB) is part of the Goldschmidt Thermit Group, that is composed of more than 20 middle-sized companies worldwide. Thanks to the efficient networking of the Goldschmidt Thermit Group of companies and worldwide partners, Thermit Welding (GB) is able to access a large range of top of the line rail equipment. The Goldschmidt Thermit Group has its beginnings in the “Allgemeine Thermit-Gesellschaft” company, that was foundered by the brothers Karl and Hans Goldschmidt in 1900. Hans Goldschmidt was the inventor of the Thermit welding process, a process which is still used within the group today, and for which the Goldschmidt Thermit Group still holds the Patents. The Patent for the aluminothermic process invented by Hans Goldschmidt has been owned by the Goldschmidt Thermit Group, in all its incantations, for over 120 years and has been a focal point within the company for all this time. Thanks to its constant innovative drive the Goldschmidt Thermit Group is today the global market leader with different Thermit® processes for the continuous welding of rails and enjoys global success with a wide range of products and services for the construction, repair, maintenance and renovation of railway tracks. This success story only became possible due to the innovative drive of Prof. Goldschmidt which remains with the company today, as future thinking has a tradition at Goldschmidt.